The First Sunday of Lent is an important one in the life of the Church. Together with Ash Wednesday it marks the beginning of that journey we all make in following Jesus to his Passion in Jerusalem,is death at Calvary and his Resurrection in the Easter Garden. Whilst this is a personal journey for each of us who follow him, it is also the journey of the church as we move together towards the heavenly Jerusalem where we shall be united with God through the saving works of Jesus Christ in the power of the Holy Spirit. The gospel passage of Jesus stepping out into the desert at the beginning of his public ministry sets the scene for our Lenten journey. We are told he was ‘tempted’ for forty days and forty nights. ‘Tested’ is a better translation. 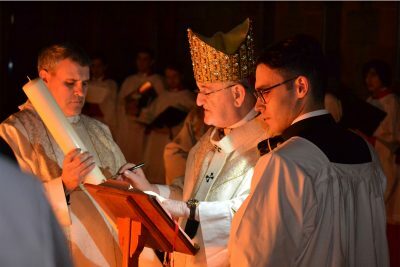 He struggled to discern how best he was to fulfil his mission and purpose, affirming at the end of this time that “Many does not live on bread alone but on every word that comes from the mouth of God”. The forty days of Lent also take their inspiration from the forty years the People of Israel wandered the desert in search of the Promised Land. They had escaped from slavery in Egypt, led by the faithfulness of Moses who himself never entered that land, although he saw it from afar. At a time when modern day slavery is on the agenda in every western country, it is good to be reminded of the things that enslave us as individuals whether these be money,material goods,power,or earthly appetites. The most painful slavery suffered by the Israelites was that they were forced to worship the false gods of the Egyptians. Their escape to the Promised Land enabled them eventually to worship the one true God in the Temple in Jerusalem. Lent is a time to examine the false gods that we worship in our own age and take seriously the words of Ash Wednesday “Repent and Believe in the Gospel”. Each of us is invited to make a journey to that desert place which is deepest within us. Dry and arid because this is a place where no light is shone,no growth takes place, no healing water of God’s healing grace is allowed to refresh it. The psalmists have a great deal to say about healing waters and dry bones which need to be brought to life again by our turning back to God. The Lenten exercises,prayers and penances we undertake are meant to be our signs of that inner conversion. 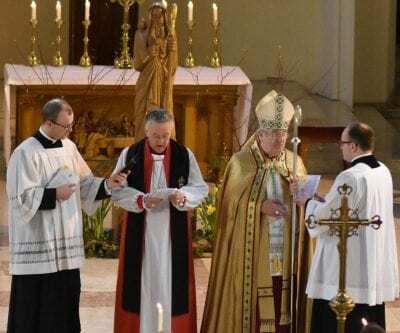 Although individualism is one of the identifying marks of the age in which we live, being members of the community of faith which is the Church reminds us that we are not alone. Those who have gone before us have mad the journey of faith, too, and are an inspiration to us on our pilgrim way. What an inspiration, therefore, to witness the Rite of Election at St. David’s Cathedral on the First Sunday of Lent, of those adults who are seeking Baptism in the Church and those who are already baptised in other Christian denominations an wish to come into Full Communion with the Catholic Church. 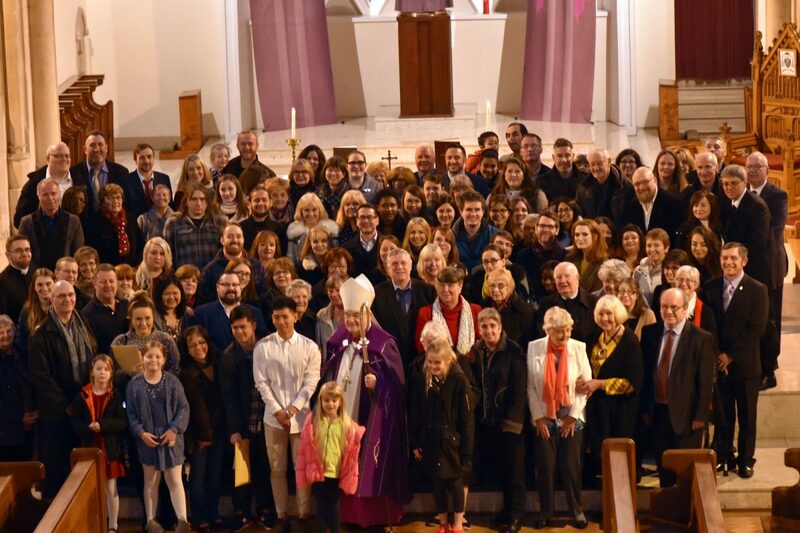 Our photo shows the 28 Catechumens and 38 Candidates who gathered with their sponsors and hundreds of family and friends to mark this significant moment in their journey of faith. 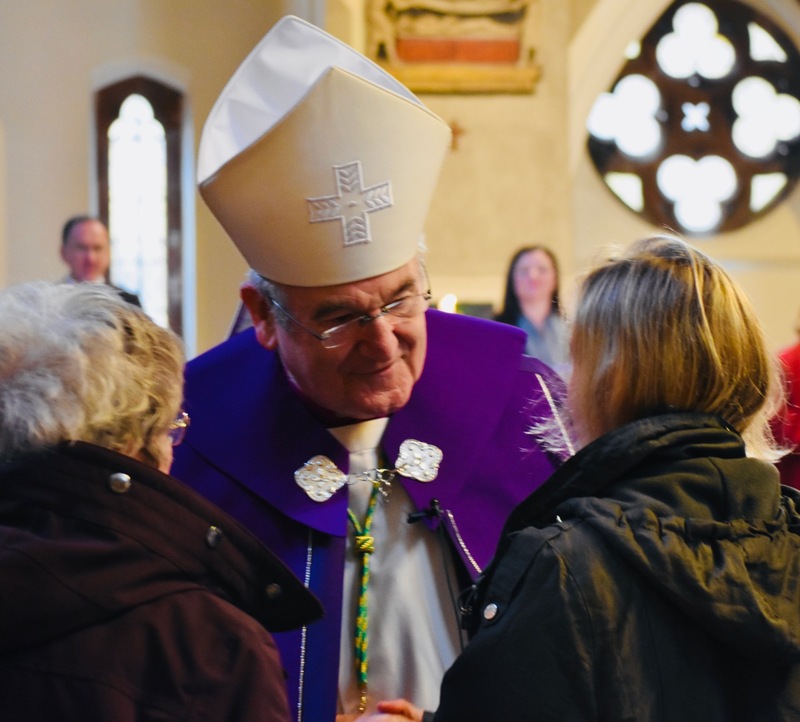 They can be assured of a warm welcome at the Table of the Lord in their own parishes when they will be baptised and received, confirmed and receive Holy Communion as members of the Body of Christ. “We are an Easter People and Alleluia is our Song” said Pope John Paul ll. We look forward to celebrating that truth,and so much else, during the coming Easter Vigil.